Great place! Maria was really nice! Follow her instructions to the house, do not trust google map. Lovely property close to Agios Nicolas port. Delightful hosts! If you read this then the best thing to do today is to book this room. It’s the best place we’ve ever been. Maria and her son put a lot of effort and love into this place. The rooms are huge and have a wonderful view over the sea. Very comfortable bed, clean and spacious bathroom. The small restaurants and shops provide everything you need and it’s the perfect place to start your tour to the shipwreck beach and the caves. Btw: we recommend kayaking to the caves, it’s much more fun than being squeezed on a boat with 30 other people all fighting for the best selfie spot. Enjoy your stay! Our stay in Vigla was beyond our expectation. Maria the owner was super friendly and hospitable. The property is somewhere in the mountains and the place is so peaceful and full of positive vibes . We enjoyed the spectacular view of the sea and Agios Nikolaos from the balcony every single day! If I ever come back to Zakynthos, Vigla would be the place I stay. Wonderful sightseeing from the balcony of the villa. Very clean and cosy rooms. The hostess is very kind and helpful. Very good breakfast. Everything was perfect. Actually I didn't remember how it was on Booking and I had a great surprise when I arrived. The place is stunning, the house is big and tottaly equipped, the view is amazing and it's very peaceful. You can ask for a breakfast and it's excellent, witha lot of options (homemade bread, eggs, yogurt, fruits etc). I loved every single thing in this place! We loved everything about this property. We were greeted by our smiling hostess who provided a delicious, free, welcoming Greek dish. The views overlooking the ferry harbour way down below were stupendous; the breakfast we ordered was copious and delicious, the large, stylish, iron-framed, four-poster bed was large and comfortable, and the location was stunning. Nice location. Really nice views to wake up to every morning. Very clean property when we arrived and it is cleaned every day. Close to Shipwreck viewpoint and close to Xigia Beach and Makris Gialos beach. The lady who owns it was very kind. I would stay here again! Beautifly located, large, cozy and very well equiped space. Very nice arranged interior, amazing view. The Staff very friendly and helpful. We would like to come back there! Location was near the St Nikalos port by car. It is a very quiet and natural place. The room was very big with a beautiful balcony. The decoration was lovely and comfortable. The owner family was very friendly and helpful. It was a very nice stay for us and we will never forget Vigla. Lock in a great price for Vigla – rated 9.6 by recent guests! Perched on a green hill overlooking the Ionian Sea, the family-run Vigla is located in Agios Nikolaos of Volimes, within 0.6 mi from the beach. 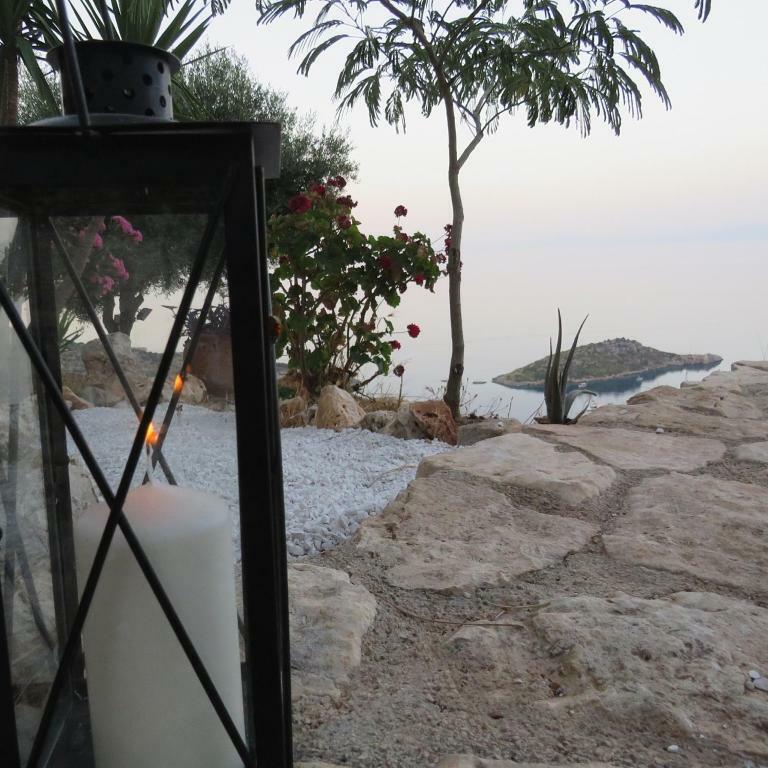 It offers a blossomed sun terrace and self-catering units with sea and garden views. WiFi is offered throughout. Fitted with tiled or wooden floors and beamed ceilings, the studios and apartments of Vigla are decorated with wrought-iron beds and traditional furnishings. Each air-conditioned unit has a kitchenette with dining area, fridge and a small electric oven. A TV and a bathroom with shower are available. Guests will find taverns and mini markets within 0.6 mi from Vigla. Zakynthos Town and Port are at 16 mi, while Zakynthos International Airport is 18 mi away. The sandy beach of Makris Gialos is at 1.9 mi. Guests benefi from free tickets for guided tours to Askos Stone park. The owners can provide all the necessary equipment for fishing in the area upon charge. Free private parking is possible on site. This property also has one of the top-rated locations in Volímai! Guests are happier about it compared to other properties in the area. This property is also rated for the best value in Volímai! Guests are getting more for their money when compared to other properties in this city. 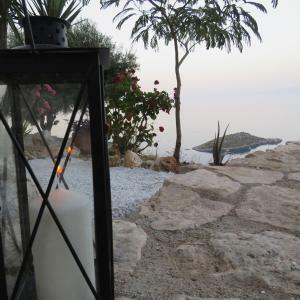 When would you like to stay at Vigla? -a private bathroom with shower. Please note that this studio can accommodate an extra bed upon charge (see hotel policies). Please note that some units are split level. All apartments can accommodate 2 extra beds. House Rules Vigla takes special requests – add in the next step! All children under 6 years are charged EUR 11 per night for extra beds. Vigla accepts these cards and reserves the right to temporarily hold an amount prior to arrival. Please note that free Wi-Fi is provided in all areas of the property. Please note that Vigla can organize fishing upon request and at extra charge, weather permitting. Please inform Vigla of your expected arrival time in advance. You can use the Special Requests box when booking, or contact the property directly using the contact details in your confirmation. The bedrooms were only separated from each other by a curtain and a staircase. No doors. This is not a criticism, just some advice for visitors to find the property. If you can access the Booking.com app on your phone, you can prompt the app to divert to Google maps (or Apple maps) and it will guide you to the door. Otherwise, when driving north to the ferry port of Agios Nikolaos, within a couple of miles of the port, keep a lookout for a signpost on your left for Viglia (or Vigla, can't remember) and turn left there and drive uphill for several miles, making sure you follow the signs. The road intersects eventually with another, where you must follow the sign and turn left (uphill again). Very shortly you will come across a sign on the right pointing to Viglia Villas. This is where you turn, and within a short distance you will see the pillars and metal gates on the right-hand side. You have arrived. The hot water in the shower was somehow not constant? It seems like it will go on for 15 minutes and then gets cold again. THE VIEW WAS AMAIZING...THE HOST AWS VERY NICE . Spectacular views down across the bay from the balcony of the 2-storey house. Spotlessly clean, simply furnished, cool and light. Not luxurious but thoughtfully and tastefully presented. Extremely friendly and helpful owner. Car an essential - app 10minute drive into Aghios Nic. We will definitely return. 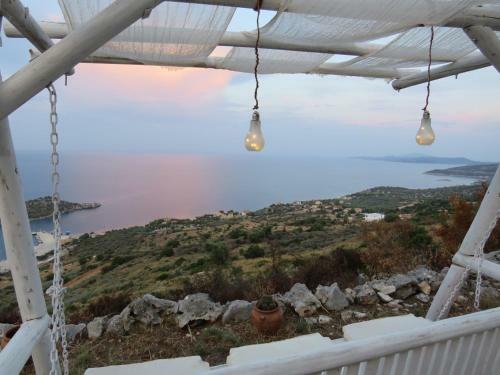 Truly spectacular site high above Aghios Nikolaos with wonderful views from the terrace. Maria and her family could not have been more welcoming or helpful. Great location! Comfortable beds and lovely balcony view!